Marvel’s Cloak & Dagger continues the search for answers as Tandy and Tyrone pursue their own investigations in an effort to get closure on their personal losses. For Tyrone this means immersing himself in the life his brother was a part of by joining Duane’s group of drug dealers. It’s clear by now that this involves compromising his principles but he sees this as an acceptable compromise if it means understanding what happened and achieving the end result of bringing Connors to justice. At first he tries the direct approach by asking if he can work with Duane which doesn’t work because Duane doesn’t want him involved in something so morally murky. This along with a conversation outlining Duane’s point of view builds on the idea that people are more complicated than they seem. Duane understands that what he does is both illegal and morally wrong but he also sees it as necessary for survival given that he is black in a system that doesn’t seem to care about black people. Even if what he does isn’t accepted as legally or ethically correct then his motivations are made clear and tie into the established work done on the racial tensions that exist within the world of this show. I did have my issues with this particular plot as I never quite bought into Duane believing that Tyrone would become a drug dealer. Granted he doesn’t know Tyrone that well other than nostalgic memories of him being a child but Tyrone’s mannerisms don’t exactly lend themselves to the morally corrupt side of life. 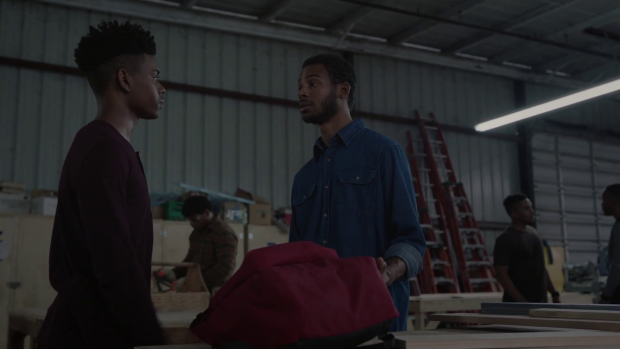 He does retrieve the bag before the police can find it and says all the right things to get Duane to trust him but something about the partnership feels off and I feel that Duane should at least suspect that Tyrone is up to something. I found them being in conflict over Duane being friends with the guy that murdered his best friend though there isn’t really any narrative progression to that unless Duane feels willing to work with him. Tandy’s side of the story was much more interesting. She poses as Mina Hess’ (Ally Maki) intern. Mina is the daughter of a survivor of the oil rig explosion who knew her father so Tandy sees this as an exploitable connection to learn more about the explosion as well as her father. Their scenes together are great because they are wonderfully character driven. 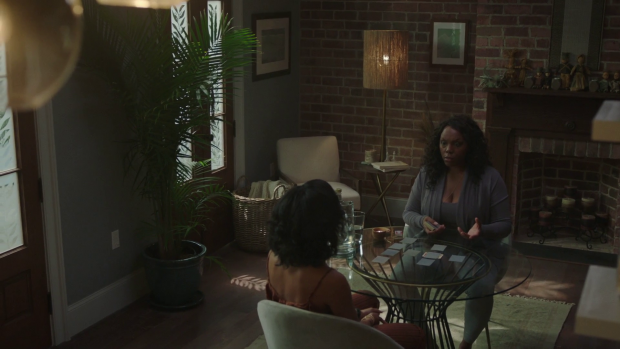 Even though Tandy is lying about her name, reason for being there and some other details she finds herself able to open up to Mina about the things that count. Olivia Holt plays Tandy with a strong degree of serenity as she interacts with someone who knows so much about her father and has an obvious desire to do good. It’s clear she finds it infectious and inspiring which makes her really value their time together. There are several subtle signs of a kinship forming that could easily transition into friendship. The clearest example is when Tandy is about to touch Mina to see her hopes and decides not to which shows how much she respects Mina. It links back to Tyrone’s point about violating privacy last week and this week she actively decides to respect Mina’s privacy because she really wants to gain her trust rather than manipulating her. Once again this discounts the lies but Tandy is more honest with Mina than she is with most people because the respect between them grows so quickly. Mina is an interesting character in her own right. Her enthusiasm comes across clearly thanks to a really engaging performance by Ally Maki and the desire she has to save the world can’t be anything but entirely genuine. A great example of this is her desire to find a particular species of Bee because she is legitimately concerned about what the world will lose if that Bee happens to die out. It shows that she cares about nature, understands the impact humanity has had on the particular ecosystem she is currently studying and reinforces that she isn’t a part of the soulless capitalism that defines Roxxon. It seems that Roxxon have hired her to tick a particular environmentalism box and she takes advantage of that because of the resources that gives her access to though she won’t compromise her morality for that money. She’s also clearly fiercely intelligent. She manages to figure out through context that “Liz the intern” is actually Tandy Bowen and is able to look past the deception to see why Tandy would be motivated to deceive her in the first place. The conversation around Mina’s catatonic father, Ivan (Tim Kang) is really illuminating because it allows both of them to be on the same page and connects them through their shared lost childhoods. Mina’s association with Roxxon is in pursuit of answers so she and Tandy will make for a great team in that regard because they both feel that Roxxon has taken a lot from them and are determined to find some kind of closure. Tandy’s encounter with Mina’s father adds further intrigue. She sees someone who’s trapped inside himself and can possibly be saved though she is unable to open up that part of his mind because she is repelled by an effect that looks a lot like Tyrone’s powers. This either means that Tyrone is the only one who can overcome that though it’s more likely that they will have to work together to unlock that part of his mind and let Mina have her father back. I’d be surprised if it takes just one of them to do that given the repeated focus on the strong connection between Tandy and Tyrone so far. On a plot level there are strong hints of a corporate conspiracy at play with the reveal that Roxxon were drilling for something that burns far hotter than oil. This makes it more powerful and more valuable so naturally it’s something they want to have control of. Their haste to get to whatever the substance is resulted in the catastrophic life defining explosion because of the outdated oil rig that couldn’t handle the substance it was designed to collect. It’s an example of greed causing carelessness and a relentless desire to cover up their mistakes that results in lives being destroyed in the process. The main issue with Roxxon is that there isn’t a lot of nuance to them at this point as everything they do seems to be akin to what a cheesy comic book supervillain would do. It doesn’t clash with the overall tone though the omniscient infinitely resourced faceless antagonist will get old very quickly. At least for now the characters who oppose them and their motivations are strongly developed which is enough for now though at some point there will need to be a well defined representative of the company to oppose. O’Reilly continues to be a fascinating presence with a lot to offer. For now she seems to have gained Connors’ trust and is able to work with him without him being suspicious that she is working against him. She is definitely playing a dangerous game as evidenced by Officer Fuchs (Lane Miller) paying attention to what she’s doing and gives her a clear warning about where it may lead. There is all sorts of foreshadowing of upcoming problems for O’Reilly and I like that she seems overconfident when it comes to her ability to handle the situation. Having that layer of uncertainty when it comes to her ability to handle it and lack of awareness of when she might be getting in too deep adds further complexity to the show and makes O’Reilly even more interesting as a result. I find fallible characters who bite off more than they can chew infinitely more interesting than those who never make mistakes. Evita’s conversation with her Aunt Clarisse (Angela M Davis) was a confusing addition. It’s good that the show is continuing to feature the Voodoo culture after establishing it in an earlier episode but I fail to see the point of this exchange beyond clumsy foreshadowing. Clarisse talks about two people with a connection, how Tyrone might be some sort of chosen one and makes a dark prediction about one of the connected being destined to die. Obviously the intention is to hint that either Tyrone or Tandy will be the one to die -and I can’t help but think about Thanos’ plan in Avengers: Infinity War as the possible cause of that- though I think it’s more likely that Evita will end up being the victim. It would make sense since Tandy and Tyrone appear destined to be together which means that Evita is simply in the way of that. I hope this isn’t the case and that death ends up being something more abstract but all signs seem to be leading that way. In terms of the execution of Voodoo culture I still have no idea if its respectful or accurate though I will say that this usage comes across as cliché to me with Clarisse having a supernatural sense about the world around her and the tarot cards revealing hidden meaning that connects to what is going on elsewhere. Whether it’s accurate or not I don’t think this plot works all that well and Evita could have been used in far better ways. Another strong episode that uses the characters to drive the plot but doesn’t quite pull it off in all cases. Tyrone investigating Duane by pretending to be one of his drug dealers both works and doesn’t. 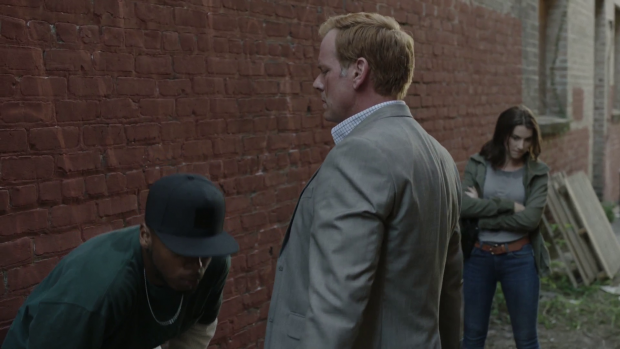 It works in the sense that Tyrone is trying different angles and exploiting a connection in an interesting way but it falls flat to a degree because it’s difficult to accept that Duane would buy Tyrone becoming a drug dealer. He does the right things but his mannerisms don’t quite add up to something that someone as seasoned as Duane would accept. Granted if he didn’t buy into it then there would be no opportunity for Tyrone to investigate because there is a fair bit of conflict between them that highlights Duane’s understandable motivations. Tandy and Mina are a lot more interesting because there is a kinship that forms between them despite the lies that Tandy tells to get close to her. It’s a great opportunity for her to learn things about Roxxon and her father while appreciating Mina as a genuinely good person who wants to do good in the world. They are connected by their need to know the truth and both have similar values. The added intrigue involving Mina’s father and what it might take to cure his catatonic state reinforces the Tandy/Tyrone connection and injects some hope as well. O’Reilly is showing signs of getting in deeper than even she realises with Connors and his corrupt ways. Officer Fuchs gives her a friendly warning but O’Reilly is convinced she can handle it when she probably can’t. It’s compelling to have characters who are fallible rather than never making mistakes. The weakest link of this episode is the Evita/Clarisse exchange because it comes across as weak foreshadowing and vague hidden meaning that doesn’t really add anything to the overall narrative. I appreciate sticking with the Voodoo angle but there had to be a more interesting way to use it.